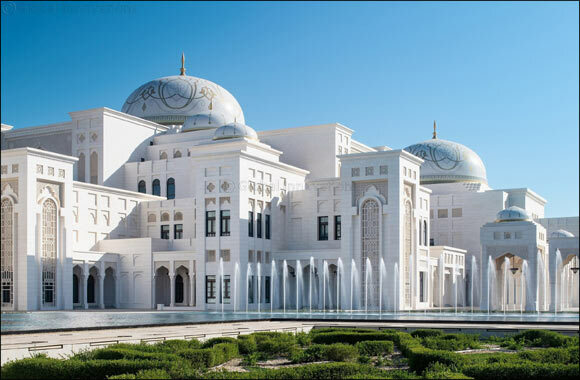 Abu Dhabi, 25 March 2019: The spectacular new Qasr Al Watan Library, located inside Qasr Al Watan Palace in the Presidential Palace compound, is now open to the public, marking the addition of a major new attraction to Abu Dhabi’s cultural and tourism assets. Inaugurated on March 11, Qasr Al Watan Library is distinguished by its exceptional location in the centre of the Presidential Palace, which is now one of the few open-to-public presidential palaces anywhere in the world. The library features an extensive collection of 50,000 titles on different branches of science, as well as a wide range of literature about the United Arab Emirates, which has been collected over more than 35 years. It provides access to references on historical and geographical topics, and the development of the UAE socially, economically, politically and culturally. Additionally, it includes a collection of UAE’s legislative material, official and historical documents, as well as documents chronicling the history of the region. “Qasr Al Watan Library embodies the UAE Vision 2021, which is based on the pillars of supporting the development of a knowledge-based economy to promote and sustain investment in human capital,” said HE Mohamed Khalifa Al Mubarak, Chairman of DCT Abu Dhabi. The library’s collection consists mainly of publications from cultural institutions, research centres, official bodies and UAE publishers. It contains books covering a broad range of fields including archaeology, history, heritage, biographies, human and social sciences, statistics, administration, culture, literature, arts, and other subjects of public interest. The collection serves as a base for the future expansion of the library through interactive programmes, in addition to promoting the development of the paper and electronic publishing and multimedia industry within the UAE. Qasr Al Watan Library is considered a unique addition to the series of public libraries in Abu Dhabi, providing the public with valuable sources of knowledge and books on the latest technologies and advanced sciences. It also provides an integrated reading experience, as resources are offered in both Arabic and English as well as other languages. These resources include printed books, e-books, audio and visual content, periodicals and multimedia. Additionally, the library includes dissertations, research articles, newspapers, magazines, notes, reports, encyclopaedias, book summaries, references in dictionary format, databases and rare manuscripts. The interior of the library offers a comfortable reading, research and writing environment with well-appointed, modern rooms. It is equipped with the latest computers allowing easy electronic browsing. It is also working towards developing its interactive applications to further enhance the availability of information and various resources. The library's role is not limited to its comprehensive collection of books and resources. It also plays a key role in stimulating dialogue and knowledge exchange through a series of attractive community initiatives and programmes, such as panel discussions that incorporate diversity and multiculturalism. Through a membership system, library members will be able to borrow copied materials and other resources. The library’s contents can be found online on its website. The library also provides internet access, and computers and tablets to take advantage of its e-services. The digital library also provides many resources in different formats, such as printed materials, audio and video content that members can access from anywhere in Abu Dhabi. Qasr Al Watan Palace presents a public space within the Presidential Palace complex in Abu Dhabi, which highlights the role of the UAE in the dissemination of Arab intellectual legacy, and the preservation of cultural and human heritage. Qasr Al Watan Library is open to all, and can be visited directly, or through obtaining a membership card that provides other valuable services.